If an Apple Falls Into a Hammock, and Nobody Eats It…. | Comics I Don't Understand - This site is now being updated daily at http://www.comicsidontunderstand.com. Please change your bookmark if necessary, and notify any web site with a link to the old address. 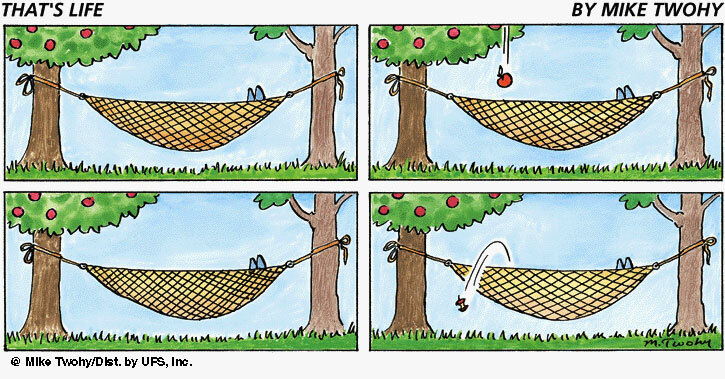 If an Apple Falls Into a Hammock, and Nobody Eats It…. So… apple falls, somebody eats it. What are we missing here? I think that in panel 4 we’re supposed to expect a Newton-like “Aha!”, instead of just an eaten apple. Here is what I think happened. The person in the hammock was asleep with their mouth open. The apple fell in, the person still asleep eats the apple and spits it out — never waking up. You lay in a hammock when you are being lazy, right? This person, being exceedingly lazy but having the kind of forethought only the most cleaver of lazies would have, had his hammock installed under an apple tree so he wouldn’t even have to get up to eat…the only effort required is to chuck out the cores. I think this is supposed to be a “cute” cartoon rather than a “funny” one – and is a variation on the “When life gives you lemons” advice. Apple falls on person, we expect to see cartoon curse words (#$%#!) – but person makes the best of the situation and has a nice snack.